In the sport of baseball, who is the top newcomer in the Big 12 this season? Texas freshman designated hitter Zach Zubia has inserted himself into that conversation. Zubia was once again named the Big 12’s Newcomer of the Week on Monday. Zubia earned that award last Monday after he hit .368 with a home run over UT’s previous five games. Texas played four times this past week, and Zubia hit .357 with three runs and four RBIs. Two of Zubia’s five hits last week were home runs. Those homers helped the Longhorns rally past Oklahoma for wins on Friday and Saturday. #Big12BSB is still swingin’ & these players are bringing 🔥. Zubia joins Kansas State outfielder Drew Mount as the only newcomers to win the Big 12’s weekly award on more than one occasion. Mount, who ranks among the Big 12 leaders in home runs and stolen bases, was honored over three straight weeks earlier this season. 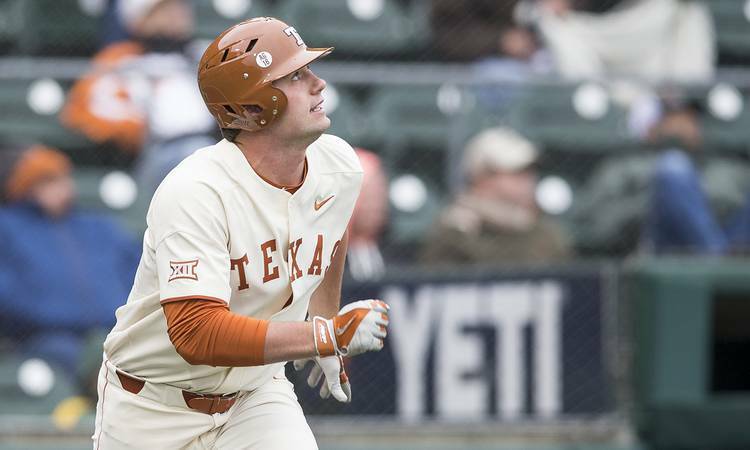 Texas junior Masen Hibbeler has also been named the Big 12’s Newcomer of the Week this spring. Zubia rates second in UT’s batting order in batting average (.299), home runs (eight) and RBIs (32). He has reached base in 37 straight games. Ranked 21st in the D1Baseball poll, Texas (24-14) will host UT-Rio Grande Valley on Tuesday night.